We’re fascinated by technology and enjoy making it work for you. Every day brings new challenges—from designing and building state-of-the-art networks to fixing printer issues—the payoff is smiling, happy customers. That’s always our goal. And, it’s one of the main reasons why QualityIP is an award winning company and has grown to be one of the largest Managed IT Services companies around. Discover what makes us stand out from the crowd. Find out a little of our history and how our commitment to customer service has grown our company. Learn about our extended helpdesk hours and fleet of tech trucks. We’re there when you need us. Our Purpose is to provide the best IT experience for our clients with a focus on quantifiable results. Discover our Vision and Mission. We’re here for you! We’ve grown to more than 50 employees. Meet the teams who are here to support you. We have loads of experience and are committed to making your customer experience the best it can be. 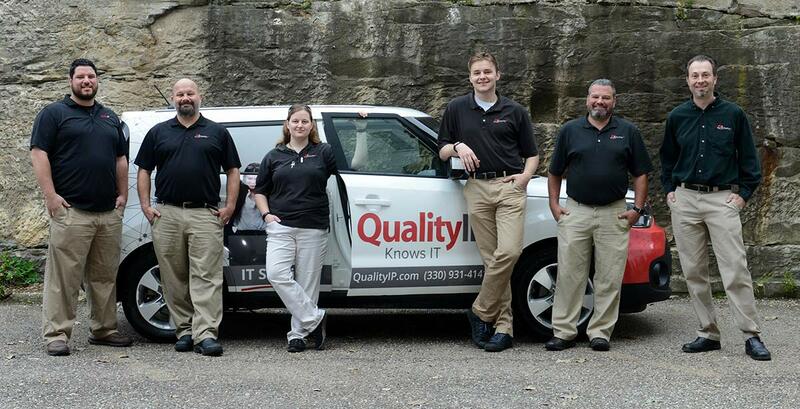 We’re friendly, knowledgeable, and ready to give you the IT options that fit your business needs and budget. When you need us at your facility, a member of our team of highly skilled technicians is on their way in one of our fully equipped Tech Trucks. You usually talk to us first and we’re always happy to help you. We listen to your concerns and assign the tech best able to resolve your issues quickly and efficiently. Under most circumstances, we’re the first to investigate your issue and solve your problem. We have expertise in all areas of IT and are ready to assist you. We keep you connected to your servers, each other and the world so that you can keep working without interruption. Dedicated to monitoring and maintaining your IT infrastructure, our goal is to prevent downtime by reviewing logs, assessing system performance, and fixing potential problems before they cost you time and money. From our remarkable growth over the past five years to our exceptional customer service standards, we’re recognized as one of the best in the business. If you love IT too, we want you to join our team. Read our take on what’s going on in the industry. Get the latest scoop from QualityIP. Our mascot, Q The Squirrel, is a fun and curious guy. Take a look at where his adventures are taking him.